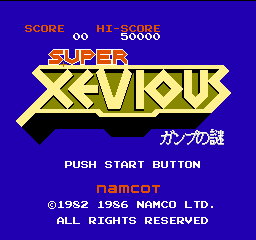 All games in tagged with "play Super Xevious - Gump no Nazo online"
Super Xevious (スーパーゼビウス, Sūpā Zebiusu) is a vertical scrolling shooter arcade game that was released by Namco in 1984. It runs on Namco Galaga hardware, and as its name suggests, it is the sequel to Xevious (which was released two years earlier). It was later ported to the Sharp X68000 in 1987, and was also included in the compilation game Namco Classic Collection Vol. 1, as well as Xevious 3D/G+ and Namco Museum DS.